Public Build is a release channel, while BETA is a phase of development. - Production Build - This is where the General Release build is distributed and is open to the general public. - Public Build - This is where the builds that are not considered stable yet are provided for testing by the general public; requires qualifying purchase; this channel typically provides a build that is in the BETA phase of development, but technically can provide a build in the ALPHA phase. - Private Build - This is similar to the Public Build channel, except it is limited to a select group of individuals that serve as the "front line" or the "canary in a coal mine" for a time before the build is promoted to a less restricted channel; this channel is more likely to see an ALPHA build than the Public Build channel is. - Dev Build - This is for a much smaller group of individuals; this channel provides "bleeding edge" ALPHA builds; sometimes referred to as "nightly", although the builds are not limited to one per night nor to strictly occurring at night. While builds in the Public Build channel do eventually replace the build in the Production Build channel, the existence of a public build does not preclude builds that are currently in the Private Build channel from replacing the General Release before one in the Public Build channel does. One of the reasons we provide a Public Build channel is to gain broader coverage of the various fixes/additions. Sometimes fixes/additions in the Public Build channel are validated more quickly than others and can be integrated into the Production Build channel while the remaining, more risky, changes are allowed to "bake" a while longer. The 8.5.1.19 version implements support for PostgreSQL and includes some bug fixes. We are well aware that we have not resolved all issues. 1) Fixed crashes related to not having Valentina installed when using PostgreSQL. 1) Added support for the PostgreSQL implementation of the Content Management Service (CMS). Valentina will still operate, but PostgreSQL is the preferred solution. Both can be installed on your machine at the same time, but only one will be used. 3) Fixed #CAR-70 - Fixed a vertex modeler lathe bug; segments were always 12 regardless of user input. 8) Fixed an issue where Save As does not remember the path when saving non .car files. The existing Valentina based service is still included and supported, however a new PostgreSQL based service is proving itself to be much more stable and much less prone to the data corruption issues that many have experienced in the past. The new PostgreSQL based service has also proven to be somewhat faster. Carrara will automatically prefer connecting to PostgreSQL if it is installed. With this new solution, there is no longer a need to start a service that runs in the background. Normally, the PostgreSQL server starts when the application starts and stops when the application stops; unless another application, like Install Manager, is connected to it - in which case it will stop when the last application connected to it closes. If you have previously purchased the Carrara 8.5 Pro or Carrara 8.5 product, launch Install Manager, log into your account and type "Carrara * Public Build" into the filter field to filter out anything else. Then simply download and install as you would normally. If you do not already have Carrara 8.5 Pro BETA in your account and you have purchased Carrara 8.5 (Pro), simply follow this link, click the "Add to Cart" button on the page and then follow the checkout process. This product is free to customers that have purchased Carrara 8.5 (Pro) and will be automatically discounted. *Note: The current version of Install Manager has a Public Build download filter that is disabled by default. You must enable this download filter to see packages in your Ready to Download list that are tagged PublicBuild. Optionally, you can locate, download and install the BETA from the Product Library [once you are logged into your account] by entering "Carrara 8.5 Pro BETA" into the text field near the top left of the page and clicking the "Filter" button, or by clicking here. Then, simply click the "download & install" button. *Note: Carrara 8.5 Standard, when run under OSX 10.9 (Mavericks) or 10.10 (Yosemite), will not accept a serial number; a fix is being investigated. Yes! You can have both the General Release and a Public Build (as well as a Private Build, for those involved in that endeavor), of the same major version, installed at the same time. Please be aware that the preferences/settings for each of the builds ARE shared between the two. What about the extensions I have? The Carrara 8 SDK has not changed in any way that causes it to be binary incompatible, which means that any extensions created for a previous version of Carrara 8 should continue to load and function with this build. Extensions that are currently built/produced by DAZ 3D will provide a separate package specifically intended for the Public Build. 3rd party extensions that DAZ 3D creates install packages for will be updated to allow simultaneous installation into the General Release and the Public/Private builds. These packages will display as "Product Updates" within Install Manager once they have been updated. Documentation is located on the Documenentation Center. The Carrara community has also produced guides and tutorials for using Carrara, see the Carrara Information Manual thread and Carrara Cafe. awesome there is light at the end of the tunnel. Wow - looking forward to test-driving this version. Great news. Downloading and will give it a spin tomorrow. I personally have not run into any of the bugs that have been fixed (I know of a couple of others...) so I may not notice any difference... They do have the comment that they haven't fixed all the bugs, so there must be some more fixes in the pipeline! This time around seems mainly aimed at Postgre or whatever. Will installing that and using it impact normal usage of the current live build? Edit: The included release note is dated Aug 26, 2013... I really need to get some sleep! Great news about Postgre. I love using it with Studio. I don't know what is a “QA Manager” because I speak French, but I thank you largely to establish the link between DAZ and us, the users of Carrara. Then, he makes its job very well because all is impeccable in the products ! While I applaud the efforts to fix the buggy bits of the software regarding smart content and triax duf imports. I am a bit wary after buying the last improvement and tend to want to hold off for Carrara 9 pro which is sort of what I was expecting you guys to be working on, rebuilt from the ground up to incorporate new technology inc Genesis with HD SubDiv morphs, smoothing modifier etc as well as maybe an improved vertex modeling room and hair/cloth dynamics. And one would expect to and would pay top dollar for that. I am hesitant to join in testing as I tend to want to just get stuff done, not fight the software to do it and come to rely on something only to have it withdrawn from use unless I pay up which is basically what happened with C8.5 and the improved fbx import which I still use extensively, that not Genesis was the only thing that sold it to me, I mostly render Genesis and certainly G2M &F in other 3rd party software and not DAZ studio though it plays a big part in it. I have no hesitation about buying DAZ content they do that well! I still thank you for working on it though and hope to see a great Carrara 9 oneday that makes the big boys sit up and say WOW too. Do you have "Public Build" ticked in your Download Filters? Ahhh, thats it. Thanks a lot Mike! Along with this beta update some free content was added in DS G2 Starter Essentials.. The first two load no probs but the third one ( Super Girl ) sends Carrara into a super hangup.. I loaded the free supersuit into DS then saved out the clothing to load up separately to work.. it seems the left boot is the problem.. the right boot loads ok but the Left one hangs the program. anyone else have this problem with the free SuperSuit? Am I reading correctly that the Beta is only for owners of 8.5, not 8.1 ? I have public build ticked, but it doesn't show up in my DIM. Can I have a pair of screen shots from you please. The filters pane that shows what is and isn't checked for download filters, and a sshot of hte downloads pane with "Show hidden files" checked. "- Public Build - This is where the builds that are not considered stable yet are provided for testing by the general public; this channel typically provides a build that is in the BETA phase of development, but technically can provide a build in the ALPHA phase. - Private Build - This is similar to the Public Build channel, except it is limited to a select group of individuals that serve as the “front line” or the “canary in a coal mine” for a time before the build is promoted to a less restricted channel; this channel is more likely to see an ALPHA build than the Public Build channel is." If its not available for everyone, as in the Public, then its Private, as in ownership of Carrara 8.5 is required (a select group of individuals). Maybe a small point, but if anyone sees it referred to a Public beta, that might be confusing. The first post did have a typo which came from pasting the same verbiage as the DS post. Thanks for pointing that out, it has since been fixed. 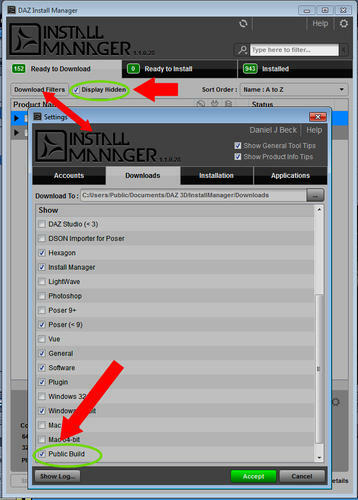 If you have previously purchased the Carrara 8.5 Pro or Carrara 8.5 product, launch Install Manager, log into your account and type “Carrara * Public Build” into the filter field to filter out anything else. Then simply download and install as you would normally. If you do not already have Carrara 8.5 Pro BETA in your account and you have purchased Carrara 8.5 (Pro), simply follow this link, click the “Add to Cart” button on the page and then follow the checkout process. This product is free to customers that have purchased Carrara 8.5 (Pro) and will be automatically discounted. The only way to install this Beta is via the DIM. Click the "Download Filters" button and make certain that "Public Build" is checked. The beta just crashes on startup only Mac running OSX 10.9.5. Anyone got this running on a Mac? It is running on 4 different Macs at the office. 10.8, 10.9 and 10.10. Several members of the Private Beta team also run Macs. I still can't view Smart Content in the Beta version, although I have PostgreSQL installed. I get exactly the same error message now as I got in the release version, about not being able to connect to CMS, but that was because I was running PostgreSQL and not Valentina. I wonder why it is not showing up for me? I even ran the latest PostgreSQL update from DIM, but it made no difference.